A friend of mine, Ev Bishop, has just released a new novel and so I thought I’d help spread the word for her. 🙂 Of course, I had to read her book first, so I could honestly recommend it, and I’m very happy to say that I very heartily do recommend it! 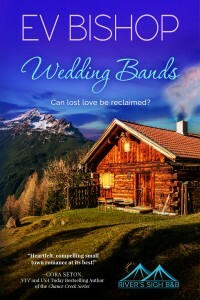 I’m not a huge reader of romance, but I have read some, and her story, Wedding Bands, is one of the best I’ve read. Her characterization is fantastic; I felt like I knew these people. Even more importantly, the story seemed real – something I’ve had a hard time finding in romance. It’s also fun and funny and heartwrenching and warm and well, romantic! So please, give it a try. You’ll find links and info below. 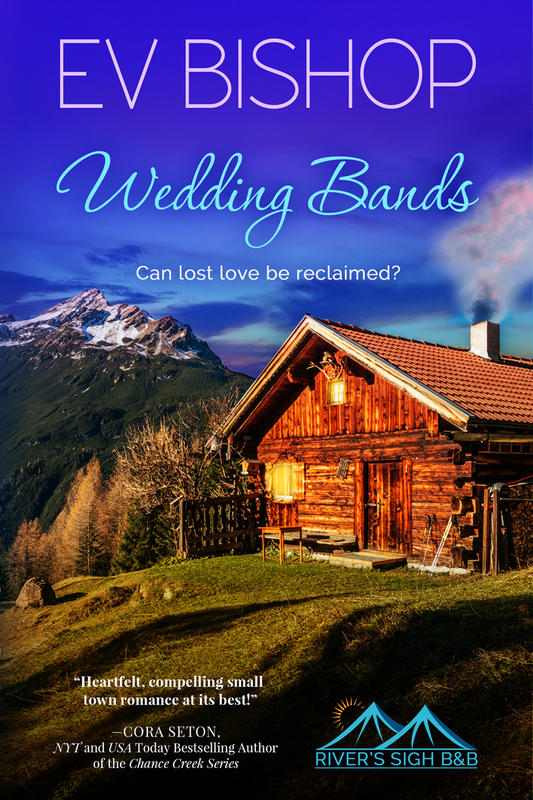 Wedding Bands, Book 1 in the River’s Sigh B & B series. Don’t have an eReader and/or prefer print books? Wedding Bands will be out in paperback at the end of the month, available for order at your favorite brick and mortar bookstore. A bit about Ev Bishop . . .
She’s a longtime columnist with the Terrace Standard, and her other non-fiction articles and essays have been published across North America. Her true love, however, is fiction, and she writes in a variety of lengths and genres. If you’re a short story lover or read other genres alongside Romance, visit www.evbishop.com to learn more. Some short story publications include: “Not All Magic is Nice,” Pulp Literature (forthcoming), “The Picture Book,” Every Day Fiction Magazine, “Riddles,” 100 Stories for Queensland, “On the Wall,” Every Day Fiction Magazine, “My Mom is a Freak,” Cleavage: Breakaway Fiction for Real Girls, “HVS,” “Red Bird,” and “Wishful,” (available through Ether Books). Women’s Fiction novels include Bigger Things (Winding Path Books 2014), which is available in digital or paperback wherever books are sold, and Mosaic (forthcoming). She also writes romance under the pen name Toni Sheridan (The Present, Pelican Book Group, 2012, and Drummer Boy, Pelican Book Group, 2014). Ev loves to connect with other readers and writers, so please consider subscribing to her newsletter and/or visiting her on Facebook and Twitter. You haven’t written anything for two days, and you fall into the pit of despair. Listening to the bickering couple seated behind you on the bus is completely fascinating. … and said story never makes it onto the page because you didn’t have any paper with you and you got an even better idea while your teeth were being cleaned. You finally get time to write in the afternoon, and minutes later, when you stop, it’s dark outside. Do you have some more? I’d love to hear them. Check out the winners for more gems here. I came across this site the other day – 12 Essential TED Talks for Writers – and thought I’d share. Eventually, I hope to watch them all. “Ever heard the phrase “starving writer”? It may help to know you’re not alone. Here are tales from authors who suffered through relative destitution before their writing took off. Can you guess who these authors are? 1. Many people know that this author was a single mother, newly divorced, living off food stamps, unemployed, in a mice-infested flat in Edinburgh when she finished her first book. Life must have appeared to be pretty bleak; allegedly, she wrote in cafes because she couldn’t afford to heat her place. Her first book contract was for a measly 10,000 pounds—not big money in the book biz. But little by little, word about her books got out. A publishing company bought the rights to publish in America for $100,000 (which seems like a steal in hindsight). These days, this author is richer than the Queen of England. You know who she is, right? Yeah—this one’s a freebie. 2. This child of a single, working-class mother started his career as a worker at a Laundromat. He was also a janitor for a while until he found work teaching at a public school. He and his wife struggled financially, living in part on her student loans and his occasional income from writing. He had to borrow money from his wife’s grandmother to buy shoes. His first book deal was for $2,500…not very much at all…until reprint rights sold for $400,000. To celebrate, he bought his wife a hairdryer. Here’s what he has to say about money and writing: “Writing isn’t about making money, getting famous, getting dates, getting laid, or making friends. In the end, it’s about enriching the lives of those who will read your work, and enriching your own life, as well. It’s about getting up, getting well, and getting over. Getting happy, okay? Getting happy.”3. This author was forced to live with impoverished relatives when his own father was thrown in jail for not paying his debts. He left school in order to work ten-hour days at a warehouse, pasting labels on boot polish. When he did return to school, he found himself thrust into a dog-eat-dog, run-down, factory-style school that churned out students. He found work as a journalist, writing under a pen name (Boz), until he began to publish serialized novels. He went on to become very famous and beloved, in part because his works so aggressively champion the causes of the poor. 4. This author might have wanted to go to college, but since he couldn’t afford it and didn’t get a scholarship, he joined the Indian Imperial Police in Burma. For a time, he lived in poverty in Paris and London, sometimes homeless, sometimes taking jobs where he could get them, caught in a cycle of receiving charity but being unable to pull himself out of destitution. When the Spanish Civil War started, he volunteered. Eventually he made a living writing book reviews and, later, war propaganda. He was forty-one when his first novel, an anti-communist allegory set in a barnyard, brought him literary success.